The patented Copal systems have been designed to unload and palletize goods from containers quickly and efficiently without any physical effort. The load can be automatically palletized or automatically directed for storage. 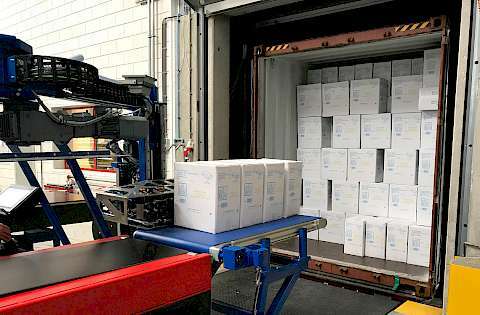 Copal Handling Systems, headquartered in the Netherlands, develops and manufactures container-unloading and palletizing systems. With these unique and innovative systems, floor loaded containers can be unloaded without any physical effort. The load (e.g. loose loaded boxes) can be automatically palletized or automatically directed for storage and interface with Warehouse Management Systems. ​The Copal systems save time and reduce costs, making it a solid investment with a high payback. Loading and unloading containers manually is labour intensive and subject to ever stricter regulations related to lifting weight. Automatic unloading with the Copal C2 improves this situation significantly and so avoids heavy physical work of employees. Copal improves the continuity of your container unloading process. 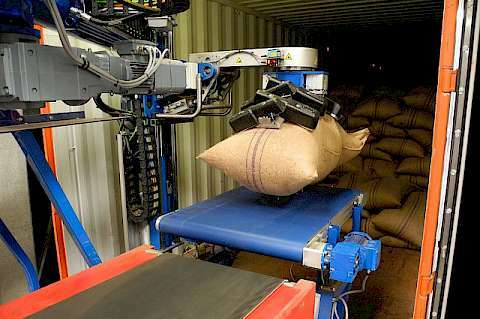 Workers’ performances decrease during manual container stripping due to heavy physical work in demanding working conditions. Also, the availability of workers in the logistics industry becomes more and more an issue. Automating your inbound process with Copal is the solution. Copal has released a whitepaper that seeks to highlight the problems surrounding the manual lifting of heavy bags from various different angles. In addition to providing practical information about lifting standards, health problems, legislation and legal perspectives, some of the major players in the international supply chain will share their experiences with alternative systems for manual lifting. The whitepaper can be downloaded via the button at the bottom of this page.